Sanné Mestrom. installation view of ‘Black Paintings’, 2018. Courtesy: the artist and Sullivan+Strumpf, Sydney. Photography Christian Capurro. 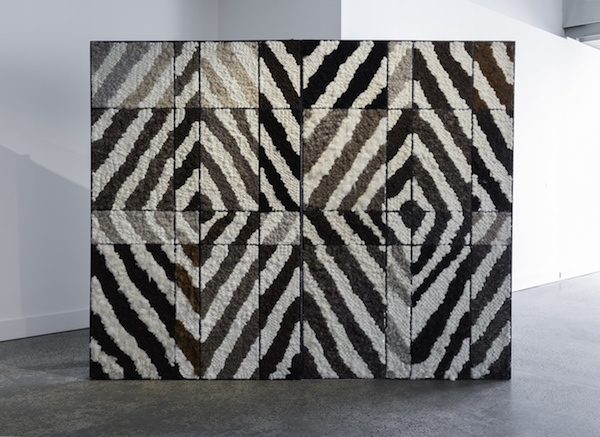 The exhibition ‘Black Paintings’, by local Karingal-based artist Sanné Mestrom, presents a series of free-standing woollen tapestries on steel frames accompanied by a suite of gouache paintings. The works celebrate the textural qualities of the painting surface and reference a series of canvases by American artist Frank Stella from the 1960s. Stella’s Black Paintings occupy a pivotal place in art history, and embody many of the contradictory impulses within late modernist artistic practice. As endearing objects encountered in the gallery space Mestrom’s tapestries act as mirrors, not for reality but for the viewer’s self as a curious and complex perceptual being.